There are no false choices for Sen. Kamala Harris (D-Calif.), and, as she explained, there are no reasons to be bound by societal limitations. The audience in a packed Lisner Auditorium roared when the senator from Oakland, Calif., appeared on stage, dancing along to 2Pac’s “California Love.” The conversation was moderated by The Washington Post’s Jonathan Capehart. Ms. Harris dodged questions about a potential 2020 presidential run, noting that she will make a decision soon. Instead, she focused on her upbringing and how that framed her political stances. She learned from her parents to be steadfast and fearless, and her immigrant parents were both very active in the modern civil rights movement. She told the story of falling out of a stroller during a march with her parents and shouting for freedom as a small child. Growing up, she would often visit her mother’s family in India, where they debated and discussed what it means to be a democracy. She would join her grandfather on walks with his friends where they discussed the need for an honest and representative government and the need to wipe out corruption. Ms. Harris said she absorbed many of those discussions, and they influenced her decision to become a lawyer. 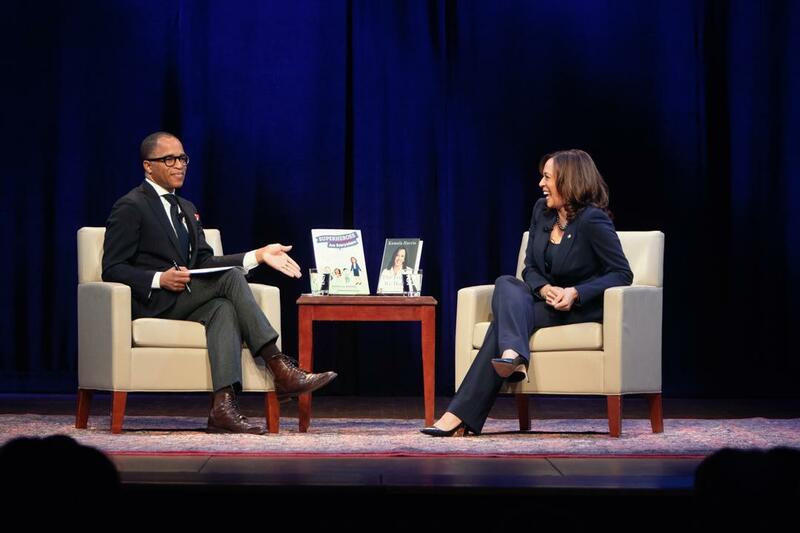 Jonathan Capehart (l) moderated the Wednesday night conversation with Sen. Kamala Harris (r). Ms. Harris said she became a prosecutor, rather than a defense attorney, to be a voice for the country’s most vulnerable people and give them dignity in the legal process. Becoming a prosecutor, and later attorney general of California, gave her the power to effect change, Ms. Harris said, like a reentry initiative to support former offenders and implicit bias initiatives in police training. She noted that there is no false choice between wanting police to stop crime while also wanting police to stop using excessive force, or between wanting accountability for crimes without mass incarceration. “For those who would like to, rightly, reform America's criminal justice system, don't lose sight of the power of the prosecutor and the power of a progressive prosecutor," she said. On President Donald Trump, Ms. Harris said that a border wall would be a monument in opposition to this country’s fundamental values. In her book, “The Truths We Hold,” she discusses the 2017 federal budget debate, saying that it offered a false choice of funding the government or opposing the border wall, and she believed then, as she does now, that we can do both. “There is a thing about leadership, which is that you have to have the courage to do things that are in the best interests of the people you lead, even if it's not in your personal best interest,” she said. “We can't be gutless when it comes to making those kinds of decisions. She said that in the midst of the current government shutdown, Democrats in Congress should not waver on their stance to oppose the border wall and should not listen or give in to the president’s “tantrums.” Ms. Harris also encouraged Americans not to lose hope in democracy and to be “joyful warriors” for what they believe in. “The beautiful design…that is our democracy anticipated these very moments, and we created checks and balances in our system,” Ms. Harris said. “The design of our democracy is being tested right now. "Any good fight is born out of optimism,” she continued. "In these moments, let’s remember that we are fighting for something and we must remain optimistic and we cannot tire. Let’s be joyful in that process." The senator from Vermont talked about his new book and what the Democratic Party must do to advance a progressive agenda. Politicians and journalists shared perspectives at SMPA event about how the new Democratic majority in the House will work with President Trump.